Mold Testing Services. Free Estimates. 24/7 Service. At DryAgain Water, Mold and Fire Restoration Services we know that mold is an extremely common problem, especially in conjuncture with other property destroying events like flood or fire. Following the event of saturation, spores, mold, and fungus can cause further damage to your property, and in some cases unsafe living or working conditions due to an infestation of spores. Mold spores in the air have been known to cause adverse health reactions, especially in the case of those with asthma or allergies, those with compromised immune response, or the elderly and small children. In those affected, mold spores in the air can cause itchy, watery eyes, congestion, skin irritation, and difficulty breathing. On top of that, mold and mildew often have an unpleasant musty odor that can linger in clothes and hair until it has become inescapable. Despite all of this, it is often difficult to tell for sure whether one has mold, without the proper training and equipment. There are plenty of other environmental hazards that can cause these reactions. The trained professionals at DryAgain Water, Mold and Fire Restoration Services have the necessary equipment and experience needed to diagnose a possible mold problem. Only when mold has been properly tested for can you begin the process of mold removal remediation and the prevention of future colonies. Mold represents an important part of nature’s recycling system. It helps to break down organic compounds into their component parts, returning the nutrients to the soil, where plants can use them for nourishment. Mold is around us all the time, and, for the most part, it is harmless. 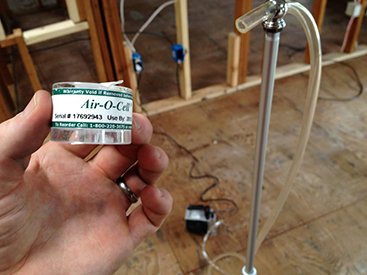 We breathe in airborne microscopic mold spores every day, without ever even knowing it. The problem comes when the floating spores encounter a friendly environment. When the proper conditions are met, mold spores will settle down and get busy colonizing—and once a colony has been established they will release even more spores, in the hopes of further colonization. Mold can grow anywhere where the humidity in the air has risen over 45% . . . an extremely common occurrence, especially during wet thawing seasons or hot humid summers. Really, mold can happen at any time. That is why it is so important to have a professional from DryAgain Water, Mold and Fire Restoration Services come to test your property for mold. We understand how mold works. We know how to test for it, how to remove the colony, and what measures are appropriate to prevent a future incident. At DryAgain Water, Mold and Fire Restoration Services we know that mold can happen anywhere, but it especially thrives in dark places with low air circulation and high levels of humidity. Mold colonies can originate from sudden water saturation events such as floods or fire-control, or burst pipes in winter. In the summer, moist air can condense on cool surfaces because of the air temperature differential, creating the perfect circumstances for mold colonization. Sometimes, water leaks can go undetected for long periods of time, creating a chronic condition. Any time you spot mold growing on the outside of a wall, the chances are high that there is a much worse problem facing you on the other side. The environment inside the walls of your home or business can differ drastically from the conditions outside, and this creates a perfect environment for mold to form. Any wall that remains wet for a prolonged period likely has mold already growing on the back side, long before you are able to spot anything on the front. If this is the case, the best option lies in containing the work space and removing the contaminated materials is the first priority, followed by the treating and cleaning of salvageable framing. Our team of experts in the field of mold testing have all been IICRC certified, which means that we have invested the money, time, and effort into providing you with the highest quality of service. Our training includes the recommended IICRC methods for dealing with mold infestation. The very first step is detection. Using state-of-the-art equipment we can identify the source of mold with incredible accuracy. If there is any suspicion of mold in or around your property, don’t wait to call a professional. 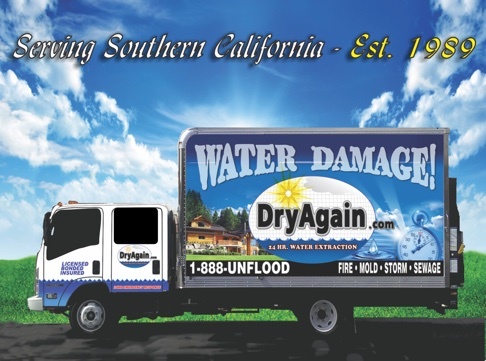 At DryAgain Water, Mold and Fire Restoration Services we know that the longer you wait, the more time-consuming and expensive full remediation can be. Once mold has been identified, we will evaluate the rate of growth, and contain the damage to the smallest possible area. Contaminated materials may have to be physically removed, which we will do promptly and safely, before treating and drying the salvageable materials to ensure that mold will not become a recurring problem. The restoration problem is complete only when your property has been fully returned to its pre-loss condition.